The rumors of the optical drive’s death have been greatly exaggerated. While many sites have talked in-depth about how optical disc drives are going the way of floppy disk drives, this popular peripheral isn’t down for the count just yet. But that count is growing – and mainly, it’s growing to account for more substitutes for the optical drive. It isn’t that the drives aren’t still useful in certain cases. For some applications, they can be vital. It’s just that their time in the spotlight as a primary storage solution for computers is wearing down as more competition comes into the market. How Can an Optical Drive Still Be Useful? Our Top 10 Optical Drives – Which is Right for You? Optical storage drives utilize lasers to read data from discs. And while this is still a viable option for playing content like movies, TV shows, and even music in a computer rather than relying solely on digital downloads – yes, physical media is still alive – it just doesn’t cut it for storage anymore. Optical drives have effectively lost their spot as a data saving resource with flash memory and cloud platforms outperforming them in the areas of storage capacity, speed, and convenience. But that doesn’t mean there’s no reason to buy an optical drive today. The tech community is good at reaching consensuses about important matters – the type of coding websites use, the kind of network protocols selected to help devices connect, the file formats used on the world’s most popular programs – all of these are naturally decided upon through an active participatory process. It’s like democracy with physical keystrokes, not paper ballots. But there’s been a growing trend toward a switch to digital alternatives of physical media. That consensus isn’t universal. 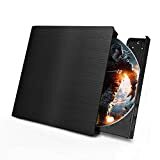 There are still some cases where physical media like discs can be useful – let’s go over a few quickly. Many people enjoy buying physical media if for no other reason than having a decorative box to hold in their hands or display in a case. Optical drives are great for giving users a way to enjoy DVD and Blu-rays. Installing drivers, programs, and updates from a company site is easily more convenient than using a disc – until your internet goes out, or the site is down. In this case, having an optical drive for installation purposes can be a great backup. Despite so many advancements in technology, some people still prefer installing programs from a disc. From the companies that make the discs to the users who prefer them, this is still a big market segment that buys optical drives. As we can see, there are plenty of options out there when it comes to using optical drives. The question now is which unit is best? Rating optical drives is a tricky process, but it can be simplified by focusing on a few key factors. The first is time-specific features. Since there aren’t a lot of cutting-edge optical drives coming out today, we must consider their technology alongside the features of the time. Remember, the capabilities of an optical drive may not be the same for your modern drives or digital platforms. The second criteria to factor in is the price. Like the features, the prices should be relative to the time. The upside to the optical drives slow descent into tech obscurity means you’ll get better prices on these drives than say, solid state drives. Finally, we’ll take into account customer feedback. In an industry where there is a lot of concern about outdated hardware being prone to failure, good ratings by customers (especially when left recently) are indicative of a better overall product. Now let’s get to it – the top ten best optical drives on the market! NOTE: For the sake of simplicity, we’ll focus heavily on external drives – otherwise you may need to find a different motherboard, power supply, and driver bundle to make the installation work! 【Plug & Play Technology】No driver program or extra power supply required, connect it via USB ports.It comes with standard USB 3.0 transmission which provides faster data transfer rates. 【High Speed Writing&Reading】Using advanced intelligent burning technology,this external drive supports DVD+R, DVD-R, CD-ROM, DVD-ROM, CD-R, CD-RW. Max.Reading Speed:DVD-ROM 8X;CD-ROM 24X;Max.Writing Speed:DVD-R,DVD+R 8X;DVD-RW 4X;CD-R 24X. 【Design with Portability】It has a sleek design that offers portability and is packed with features that offer high performance and reliability. Embedded cable design is a bonus,convenient for storage and carry. This unit is designed for modern convenience despite being an optical drive. With plug-and-play functionality, you can enjoy your physical media through a drive you can connect to a USB 3.0 port. It’s fast and slim, combining the best of both worlds in performance improvement and clutter reduction. Compatible with a full range of operating systems range back to Windows 98, the unit can be used for content playing and intelligent disc burning. 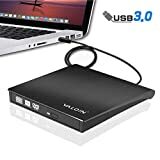 It’s a great companion for computers that are perfect except for their lack of an optical drive – and at only around $30, it’s a great deal. Valoin is a popular name in the optical industry for a reason. This unit’s high sales numbers and rate of positive feedback make it an easy choice for our top spot. Another external drive built with ultra-slim dimensions, this is a great peripheral to toss in your laptop bag or backpack before you head to class, on vacation, or toward any other destination where you may need disc media. Like the number one selection, this model from GEEKLIN is compatible with USB 3.0, though its compatibility range ends back at Windows XP – then again, how many people rock a device with a USB 3.0 port but prefer Windows 98? It’s also compatible with Linux and Mac OS and offers data transfer rates of up to 5Gbps. This unit’s secret is the copper-knitted-net tech leads. They make for better data transmission without adding much weight to the product. This high-speed DVD and CD drive can play, burn, and rewrite physical media without the need for drivers or standalone power. A common set of features for drives of this type in our top selections, this unit stands out in the areas of comfort. It is built with anti-shock and noise reduction technology. There’s also compatibility for plenty of Windows and Mac operating systems and a writing speed of 24x. Couple this with a strong design that is still surprisingly light, and you have a solid optical option. Reducing shock chances and noise are just a perk – this $30 drive comes from a trusted manufacturer and has delivered plenty of value to previous buyers. Designed for use with USB 3.0 technology, this is another drive that needs no additional drivers and no independent power supply. But it’s also backwards compatible with USB 2.0 and even 1.0. With a max reading speed of 8x and a max writing speed of 24x, this unit can produce fast performance even on older incarnations of Windows and Mac operating systems. Combined with a fashionable appearance and embedded cable, it’s a neat unit that doesn’t clutter up your setup. With shock proofing, low noise, and a price tag around the $30 range depending on where you shop, this drive is a great choice. Valoinus is another trusted tech name, and this sleek drive is smaller, faster, and more affordable than many other options on the market. 【Intelligent Technology】 This burner adopted high speed intelligent burning technology, Features strong error-correcting ability, anti-shock and noise reduction technology,support CD/DVD ROM, CD-R/RW, DVD±R, DVD±RW.with this DVD CD burner, you can watch DVD movies, install software, listen music, burn music, pictures, movies to both CD and DVD. 【Fashion & Ultra Slim Design】 Brushed texture shell brings touch and sight enjoyment. Lightweight body makes it easy to carry anywhere; Easy to assemble, push out the ODD or HDD through a button, make ODD and HDD interchange conveniently. Narrowly making it into the upper half of our top ten list is a drive targeted at Mac users – but despite the limited target demographic, this unit does things properly. It is built for Macbook Air, Macbook Pro, and iMac – though it can also be used on standard laptops and desktops with USB 3.0 ports. On the Windows side, it is compatible back to the days of Windows Vista. Smart design allows for error-correcting functionality. The result? Smoother performance. You can get more performance and speedy data transfer rates up to 5Gbps. Great for watching movies, burning copies, and more, it’s a versatile product you can rely on. And despite the gearing toward Mac, this unit can be a good buy for Windows users or even Linux users who need a fast optical drive. Though it may be intended more toward one target demographic than other, this is a device that makes using physical media quick, easy, and even enjoyable. 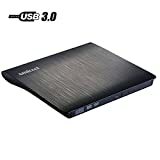 【Advanced USB3.0 Technology】Ultra slim portable cd drive is equipped with USB 3.0 high speed interface, bringing you faster data transmission speed (up to a maximum of 5Gbps) and stable performance with strong fault tolerance. Backwards compatible with USB2.0 and USB1.0. 【Pulg and Play】Easy to Use, no driver and external adapter needed, just plug it into your USB port and the DVD driver will be detected. When you connect it to the desktops, please connect it with the computer's motherboard to avoid of power shortage. 【High Performance】 It supports read CD,VCD,SVCD,CD-R,CD-RW,DVD-R/DVD-RW and burn CD-RW,CD+RW,DVD-RW,DVD+RW etc. This external dvd drive is equipped with brand new chip with strong error-correction ability, plays music and movies with no lag or distortion. Though Devancy may not be as big of a name in some circles as others on this list, this unit is barely over $20 but excels in all areas. It is sleek, small, and has a gorgeous finish. Plug and play functionality means it’s another model you don’t have to fret about when it comes to drivers. And it also can connect with desktop computer motherboards to provide better power consistency. The unit is built for convenience – error-correcting technology helps prevent disc reading issues while an eject button makes sure you don’t have to worry about jamming. This is easily a pick for the top ten – and for good reason. Slim, stylish, and built with a lot of user conveniences in mind, it’s a fast drive that performs in key areas. 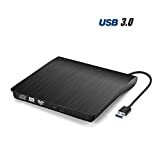 USB 3.0 HIGH SPEED INTERFACE - With This external CD Drives for laptop, it provide you fast data transfer speed and stable performance. You can record CD, music, videos, install software or create CD/DVD backup disc. It is also compatible with USB2.0. 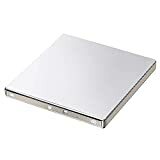 GREAT COMPATIBILITY - The CD Drives is suitable for Windows XP/Vista/7/8/10, all versions of MAC OS. It is specially designed for Apple HP Dell Lenovo and others, ultrabook,netbook,laptop and desktop without drive hardware. EASY TO INSTALL & USE - External CD Drives Pulg and paly. There is no need for additional software and extra power supply. Just Plug external DVD drive into your laptop USB interface, press pop-up button and put disc on tray, it will be automatically recognized and play. Built with a risk-free system that stabilizes voltage and comes with a two-year warranty, this product calms user fears right from the beginning. But potential buyers have little to fear, as the drive is compatible with operating systems dating back over a decade on both the Windows and Mac sides, plus a variety of Linux versions. It also uses intelligent burning technology to help you copy music, videos, files, and more from a single convenient drive. A speedy plug-and-play drive for the price, this unit has good compatibility and a slim design, making it a solid all-around choice. 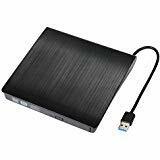 【USB 3.0 External Blu Ray 3D Drive】Equipped with USB 3.0 high speed interface, Super Fast for Reading Bluray DVD CD 3D discs:The Blu Ray dvd player read CD discs at up to 24x, DVD disc at up to 8x, and Blu-Ray disc at up to 6x. The external Blu-ray Reader supports 8.5G 4.7G 700M CD DVD burning capabilities. 【Plug & Play】Supports Playing 3D Blu ray Disc,Read Bluray DVD CD & write only on CD DVD; Support WIN XP，VISATA，WIN7，WIN8，WIN10, MAC OS. Built primarily for reading Blu-ray discs, this unit is perfect for those who like modern physical media movie discs. It’s a fast drive that also works with USB 3.0 connectivity. While it only supports Blu-ray reading, it is capable of writing CDs and DVDs. This makes it great if you’re a movie buff who still wants to burn CDs for your car every once in a while. Add in great error-correction technology and noise-reducing design, and you have a high-end drive anyone would like. The only thing that stops this drive from placing higher is the price – it’s nearing the triple-digit mark, but it still has good features to warrant consideration of. ADVANCED TECHNOLOGY: Adopt Touch Control Button (SONY Touch Sensor embedded) to eject the CD disk instead of using physical key, ensuring long lifespan; Adopt color changing Working Light to indicate different working status; Adopt stylish and trendy design, equipped with scratch-proof exterior, slim and portable. USB 3.0 SUPER SPEED: Equipped with USB 3.0 interface, achieving up to 5Gbps high speed data transmission, backwards compatible with USB 2.0, providing strong fault tolerance and more stable data transfer. PLUG AND PLAY: Tintec DVD player is powered by USB port, it will be automatically detected by your PC after connected to USB port(No external driver required), You can burn files, install software and create a backup CD. For an optical drive, this is a decent showing by Tintec. It doesn’t have Blu-ray compatibility, though it can burn and rewrite both CDs and DVDs. It is built for high data transfer speeds and also has backwards compatibility options with both USB 2.0 and 1.0. Fashionable and built to avoid scratches, this is a durable drive you can pack in your bag or proudly display on any desk. No Blu-ray functionality here, but it isn’t a problem for some people. If you’re a DVD or CD user, this drive from BOSLISA can be a great choice. Sailing right past the convenience of plug-and-play and heading right to touch sensor functionality, this unit makes it easy to get your discs in and out. It’s designed to work with all major devices from all major OS makers and uses advanced technology to reduce error possibilities. The only drawback is it is new, so there aren’t a ton of product reviews yet! With a new drive, you have to be a little skeptical. But with a price like this (less than $30), it’s worth checking out. Optical drives aren’t gone yet – and there are still some great options on the market. Even just looking at external options, you can find a model compatible with almost any modern operating system. Whether you want to cut back on noise, save space, or save money, you can find something on this list to suit your needs. Previous articleAsus ZenBook Review – What Does This Unique Model Offer?